What is a Poster Pit? A Poster Pit is really a Poster Pit Team! It features a pit bull or pit bull mix ambassador that exemplifies what a poster pit bull can be and what a proper pit bull can do with training, but it also absolutely includes a handler who exhibited a commitment to training and responsible dog ownership. Our Poster Pits are an integral part of TPPB. They are the faces of our organization and examples of what pit bulls can do and become with committed owners and quality training. They are dogs who have earned a CGC, BA, are registered as a Therapy Dog team or have achieved other approved qualifications. To qualify to become a Poster Pit Team, your dog must be one year of age and must have achieved one of the aforementioned qualifications. Additionally, human handlers must volunteer for at least one event prior to evaluation. If you would like further information on becoming a Poster Pit Team, please contact the Poster Pit Manager, lindsey.dibattista@theproperpitbull.org for details. Brick was adopted with the help of PetFinder from a small rescue near State College, PA called A Darrah Bull Bully Rescue in July 2014 at 8 weeks old. He quickly became loved and was transitioned to a city dog in Pittsburgh by his parents Matt and Alexandra Andromalos. He began his training at Camp Bow Wow Highland Park with his advanced level training and continued training at WPHS. He earned his Canine Good Citizenship certification in April of 2017 and is currently working on his Therapy Dog International training and certification. His favorite things include napping on his LoveSac, chasing tennis balls, going to camp at Camp Bow Wow and attending any dog friendly events to meet new friends and enjoy the atmosphere. Penni was adopted from the Western PA Humane Society by her foster parents Lori and Mike Stadelman. Penni had to have her leg amputated at 4 months of age but that has not slowed her down. Penni has earned her PhD in Canine Life and Social Skills and her CGC certification. Penni has a furry brother that she enjoys going for walks, laying in the sun or just cuddling on the couch (her favorite) with. Waylon was adopted from the Animal Rescue League in March of 2014 at only 4 months old. His mom and dad only went to look that day and ended up adopting him on the spot. Waylon excelled at his obedience classes starting off with puppy basics then on to earning his Canine Good Citizen at 11 months old. Waylon also passed his Therapy Dog International test at a little over 1 year old, but after a few visits he showed his mom that it really wasn't his favorite line of work so Waylon went back to school and attended the Canine Life and Social Skills classes at the Western Pennsylvania Humane Society earning his PhD! Waylon and his mom will now be focusing on getting involved in the exciting world of Rally-O and Disc. Some of Waylon's most favorite things to do are going to Camp Bow Wow to play with all of his boyfriends and girlfriends, making any new dog friend that he can find, being a very large lap dog, hanging out with his bestest bull-buddy and changing the hearts and minds of everyone he meets. Keisel is a 4 year old German Shorthaired Pointer/Pit Bull mix originally found as a stray puppy in Texas. Thanks to Pet Finder he made his way to PA and went on to earn his Canine Good Citizen Certification in 2014 and his Bachelor's degree in the C.L.A.S.S program in 2016. He shares his home with Sasha, a 9 year old Pit Bull mix and Animal Friends alum and Henry, a 4 year old Pit Bull mix and Camp Papillion alum. Odin was adopted from the Western PA Humane Society in December of 2014 at the age of two by Jess Pollis, a first time dog mom. Odin and his mom jumped right into obedience class to learn about good manners and to meet new friends. Six months into obedience school, Odin earned his Canine Good Citizen and is working to become a Certified Therapy Dog. He has most recently earned his Master's Degree in Canine Life and Social Skills at the WPHS. Odin and his mom love to volunteer at events and are always excited to meet new people. Odin is very loving and enjoys a good belly rub, he is sure to put a smile on your face and most likely a kiss. Odin is best at happily wagging his tail and showing everyone how kind and gentle a Proper Pit Bull can be! Stop by The Proper Pit Bull tent at our events to meet Odin and his mom! Each of our Poster Pits have their own coloring page! Download them from the link below. 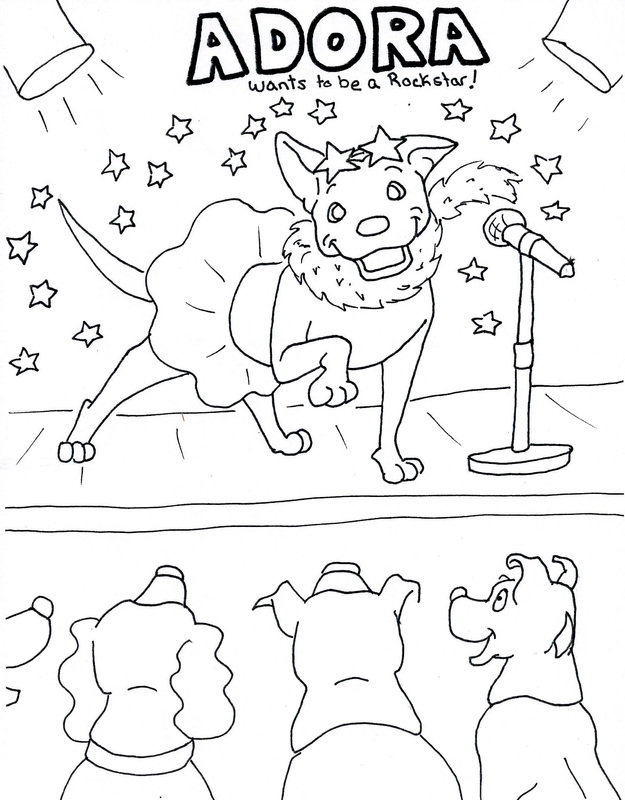 Color them in and send a photo to info@theproperpitbull.org to have your art featured on our Facebook page!